Here blow is a nice sushi bar design used in shopping mall. 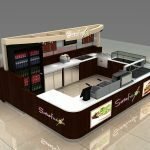 As a food serving kiosk , this model can also used for wine bar or a juice bar display. 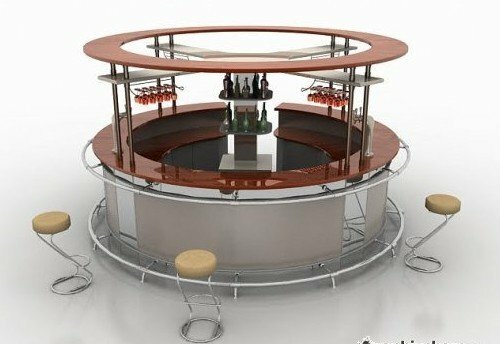 With bar stool surrounded , customer can sitting and enjoy the food or drinking. Inside are food preparing area and work station counter. There’s one disadvantage of this sushi kiosk design . The food prepare are too close to customer. if just a wine bar will be ok , if used for a sushi bar this design is not enough. So how to make a nice design with custom ideas ? 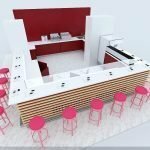 prepare a leased size and ideas of the sushi kiosk you need. 3. working with designer and finalize a perfect kiosk design. No matter what type of the business you are doing. There are two important things need to be aware of. First, equipment need to be fit inside the kiosk and easy function for workers. Second. Customer friendly using experience. This two points are the key to a business success. Even some time you need to sacrifice some designed element , but it’s a worth loss on it. Because customer is always the most important .